APNA's definition of primary health care nursing has a number of components. Primary health care nurses adopt the definition of health in the Declaration of Alma-Ata that health is a state of complete physical, mental and social wellbeing and not merely the absence of disease or infirmity. They reaffirm health as a human right and see economic and social development as a prerequisite to the attainment of health for all. They see the promotion and protection of health, including the reduction of social exclusion and disparities in health, as having positive effects on economic and social development and on world peace. Primary health care nurses see the participation of people as a group or individually in planning and implementing their health care as a human right and duty. One way of expressing this is through a phrase that originated in the disability movement, Nothing about me without me. Primary health care nurses acknowledge the dignity, culture, values, beliefs and rights of individuals/groups. Primary health care nurses are enrolled nurses, registered nurses and nurse practitioners eligible for registration by the Australian Health Practitioner Regulation Agency whose competence, as specified by the registering authority's license to practice, educational preparation, relevant legislation, standards and codes is specific to (though not exclusive to) the primary health care context. Like nurses in other settings, primary health care nurses have professional, legal and ethical responsibilities which require demonstration of a satisfactory knowledge base, accountability for practice, functioning in accordance with legislation affecting nursing and health care, and the protection of individual and group rights. Encompasses an understanding of the social, economic, cultural and political determinants of health. Ensure collaboration and partnership with other sectors to promote public health. Read the article and associated video from What is primary health care? Why is it important? from PHCRIS (published November 2015). In what settings do primary health care nurses work? Primary health care nurses work in a range of settings, each sharing the characteristic that they are a part of the first level of contact with the health system. Informal and unstructured settings including ad hoc and Good Samaritan roles in daily life, like sports settings and community groups. What are the roles of a primary health care nurse? 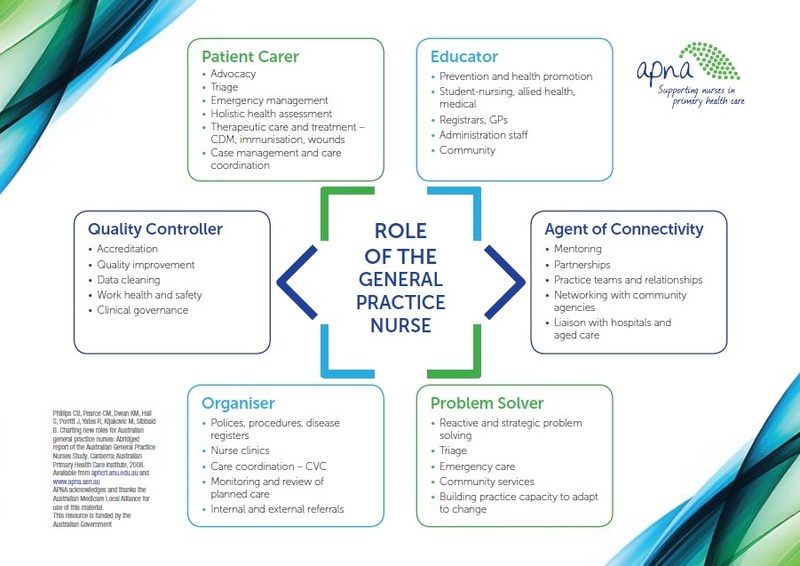 Recent research within the Australian general practice setting describes the following roles of primary health care nurses; patient carer, organiser, quality controller and improvement agent, problem solver, educator, and agent of connectivity. The relevant importance of these roles will depend on both the nursing context and the accountabilities and responsibilities of the nursing position. Read the definition of primary health care nursing below. How can a nurse contribute to my practice? Providing outreach services such as home assessments for the elderly, immunisations at workplaces and childcare centres. Planning and coordinating care including routine monitoring and follow up of patients with care plans. Participating in/leading a team approach to managing adverse events. Sourcing information such as referral options. Participation in local and/or national disease prevention campaigns (e.g. influenza). Phillips CB, Pearce CM, Dwan KM, Hall S, Porritt J, Yates R, Kljakovic M, Sibbald B. Charting new roles for Australian general practice nurses: Abridged report of the Australian General Practice Nurses Study. Canberra: Australian Primary Health Care Institute, 2008. Available from aphcri.anu.edu.au and www.apna.asn.au. To find out if your practice is eligible to receive funding support for the employment of a nurse or nurses in general practice visit our Practice Nurse Incentive Program (PNIP) page. Ever wondered what it was like to work outside of the four walls of a hospital? Interact with the community and improve the quality of health of people within the community? Find out about the rewarding and challenging career of nurses working in primary health care and why this workforce is vital to the health of the Australian people. What is primary health care? Why is it important?